It’s nice to see these cool scenes in this hot muggy summer. They’re at the VMFA. 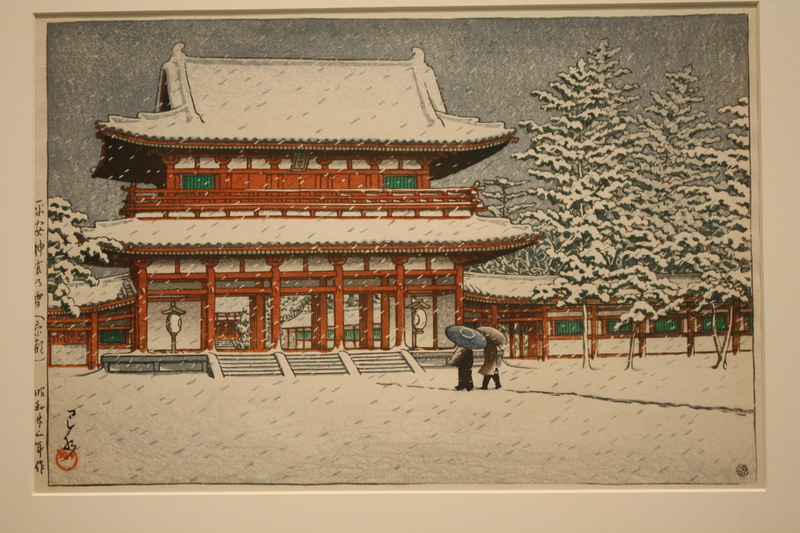 Kawase Hasui was Japanese. 1883 – 1957. 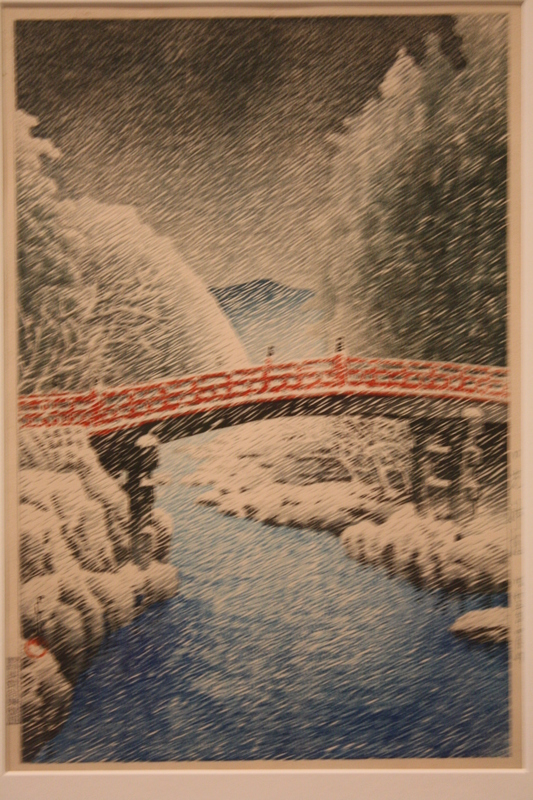 This one of the sacred Bridge is my favorite because you can see the wind is blowing the snow! Amazing! I posted the whole show so you can pick your own favorites. It’s not exactly right in proportion, but not too far off. See the photo below. This is my 3rd try drawing the sculpture. 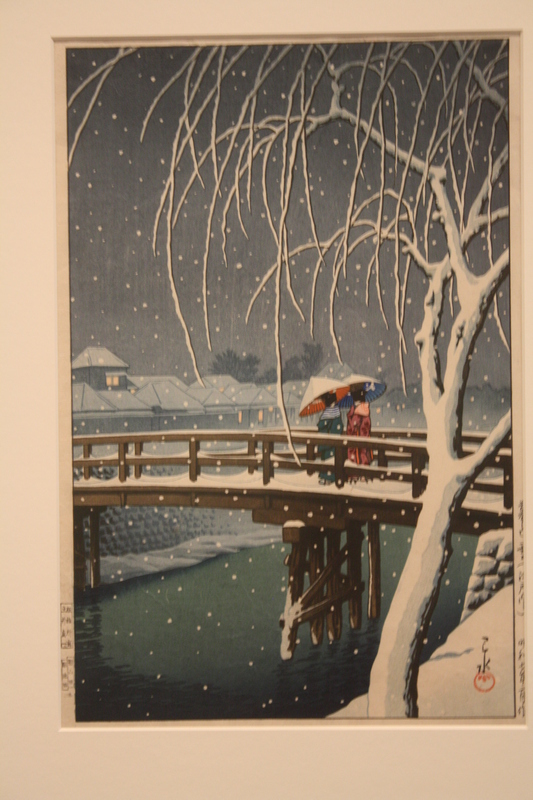 I went to the VMFA on 3 different rainy days and worked on it about 2 hours each time. Sometimes when I stand there in front of a sculpture for a few hours, I get the feeling I know what the subject is thinking. His eyes are so realistic, it seemed like he was looking at me. The eyes are made of lapis lazuli, ivory and onyx. 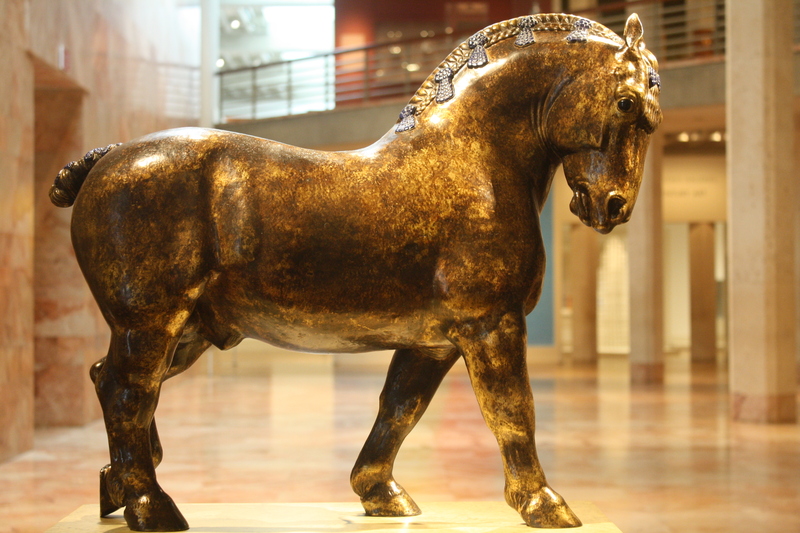 The horse is made of bronze and gold plated. I know this because I spent the time looking. If you take a photo then trace it, you don’t get that kind of intuition about the subject. At the museum, the rule is graphite only. The plaque at the VMFA says he’s a Suffolk Punch Stallion. I could ask for a permission slip to bring in charcoal, but I probably won’t. The whole permission slip thing just bugs me as an artist. 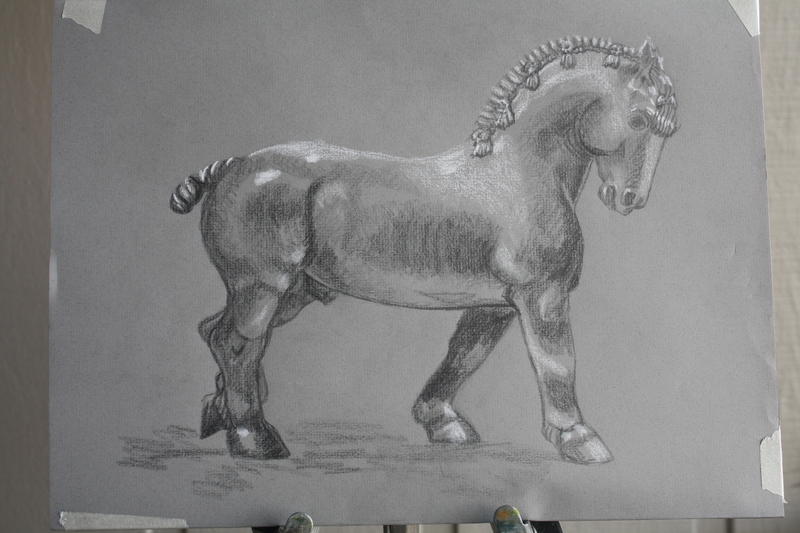 I’m saying this because if I could use charcoal it would be easier to draw. With pencil it takes longer to block in an area and you end up making outlines more often which is less accurate for getting the proportions correct. It’s difficult to measure the proportions of a horse, and every breed is different. When I got home and looked at this sketch, I knew it wasn’t right. I transferred it to another paper and did some correcting, but it still wasn’t right. I’m showing this bad sketch so you can see that it doesn’t have to be right the 1st try. You can keep trying until you get something better. 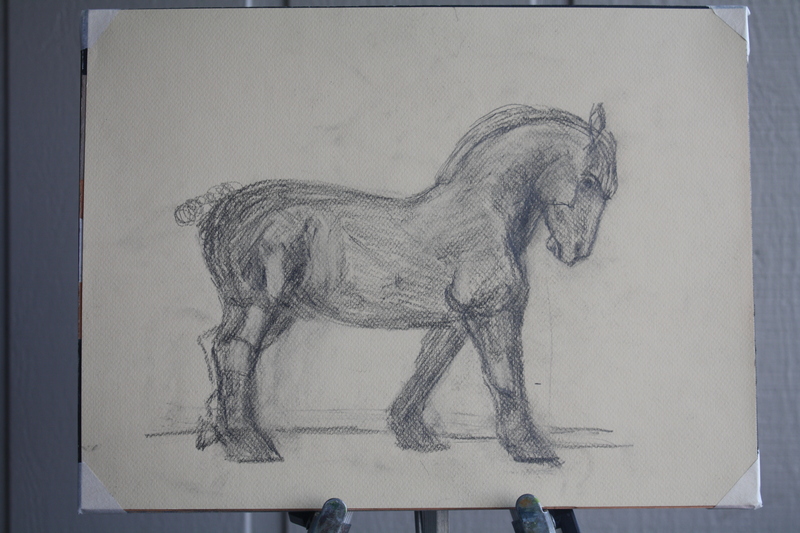 If I continue to draw horse sculptures, when the time comes that I can draw live horses, it will be a little easier because of this practice. This is the way to learn to draw. Rest your sketchbook against your body. Hold out your pencil at an arms length resting your arm on the sketchbook. Close one eye. Hold the pencil up so you can use it to measure the head of the subject by putting your finger on the pencil at the length of the head. Then use the head as a measure to get the proportions. Compare the length of the head to the length of the body and make marks on the paper in those proportions. Measure in all directions. Measure the length of the legs compared to the head. You can use the pencil in this way to see more easily the angles of the legs or any other angle you want to draw. Measure, draw, measure, draw. Don’t be shy. Why don’t the art teachers teach their students to draw like this? Is it because it’s no fun? Are they self conscious about others seeing them make a face by closing an eye and squinting? Is it because it’s a slow process and they can trace a photo so much faster? I see classes coming through sometimes, when I’m drawing, and the students seem interested in how to do what I’m doing, but the teacher doesn’t explain it to them. It seems like the teacher rushed the last group through before I had a chance to give them the art lesson they wanted to hear. Maybe the teachers don’t know how to draw, so they can’t teach it. I’d like to teach. I’m just not keen on making it into a JOB! So it goes on the blog. It’s easier to stand up to draw. 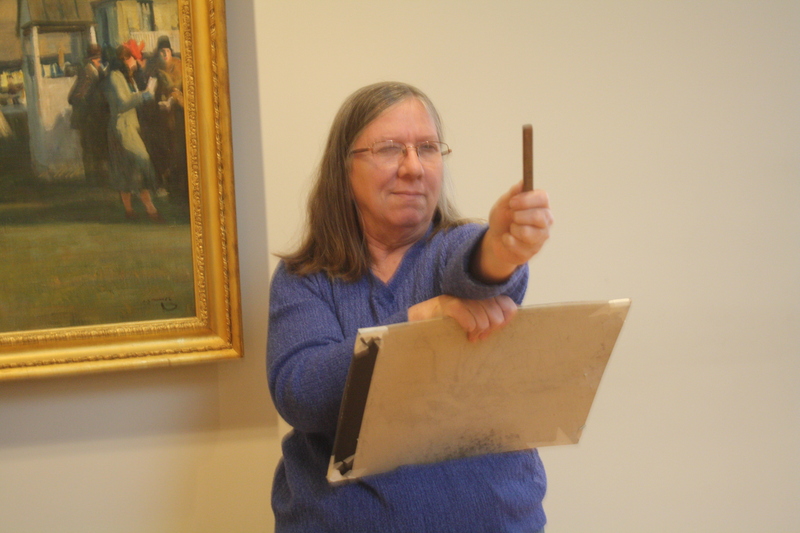 Sometimes, at places like the museum, where taking an easel is a problem, you need to be able to hold the sketchbook in one hand and draw with the other hand. That way, you can look from the subject to your sketch so much easier because you don’t have to keep looking up down, up down. 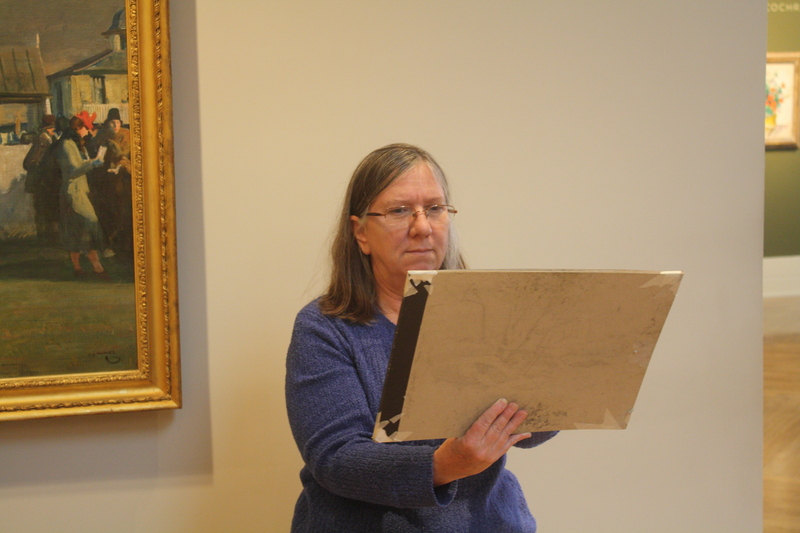 You hold the paper up and compare what you drew to the subject. Also, if you can draw without an easel, standing up, you can exit the scene faster when it gets crowded, or not block other people from the spot. The story of the Daniads is they were the 50 daughters of King Danus an ancient Greek, who were promised to marry the 50 sons of Danus’ brother. On their wedding night all but one murdered their husbands by cutting their throats. They were sentenced to carry buckets of water to fill a tub with holes in it. Also, their buckets had leaks, so they could never finish the task. 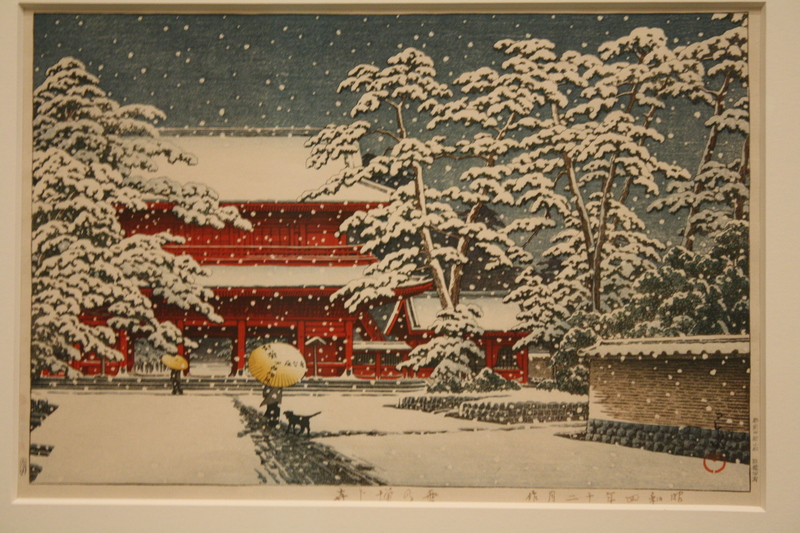 It’s a myth that was used as a theme in art by various artists. 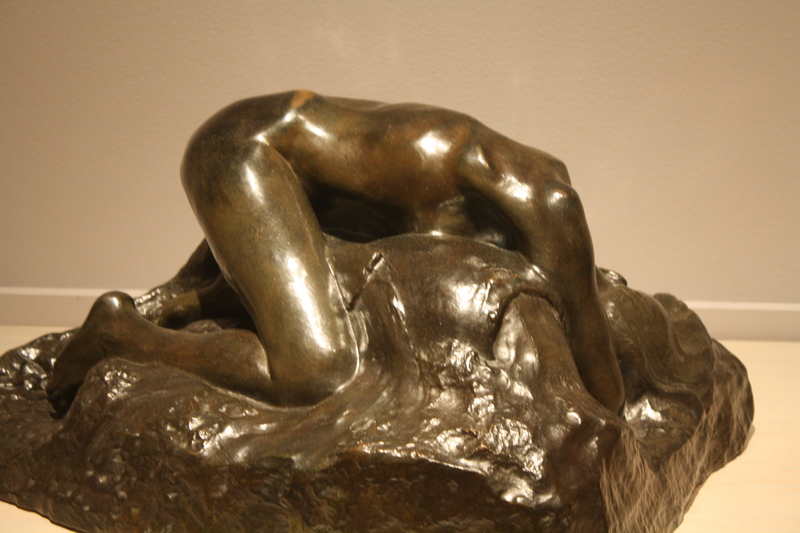 Rodin shows the Daniad collapsed by the futility of the punishment. 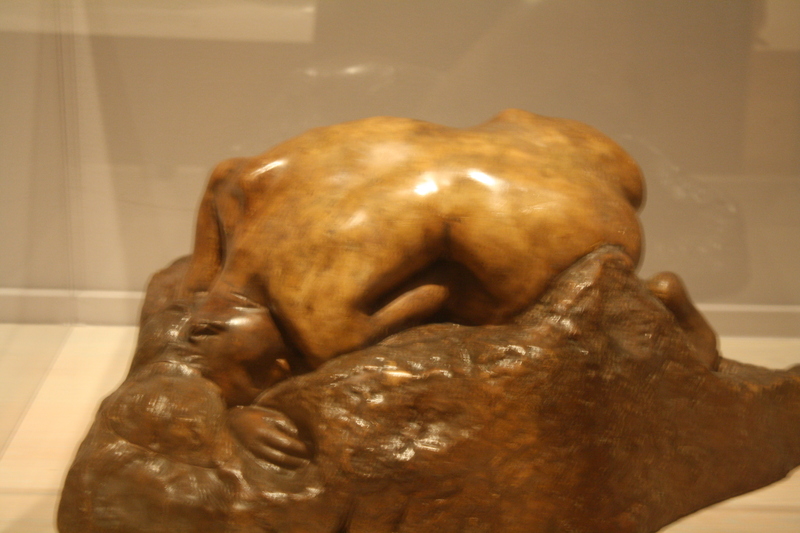 The Rodin exhibit at the VMFA is a great inspiration. 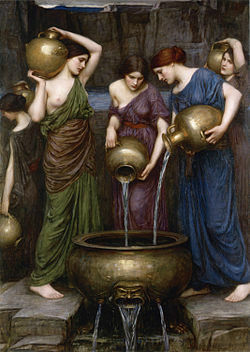 This is a Pre Raphaelite painting by John William Waterhouse showing the Daniads. 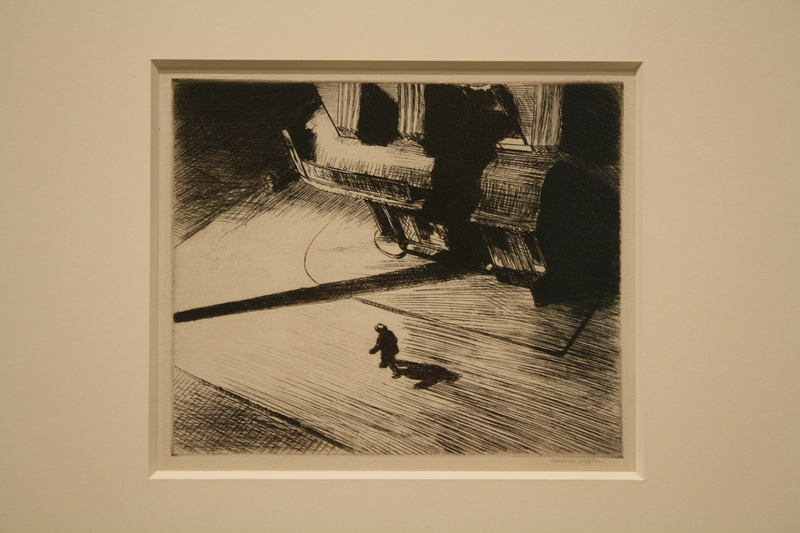 The VMFA has a show of etchings that are nocturnes. This is my favorite for the spooky look. I heard nocturnes are difficult to do and I like them so I always wanted to try. 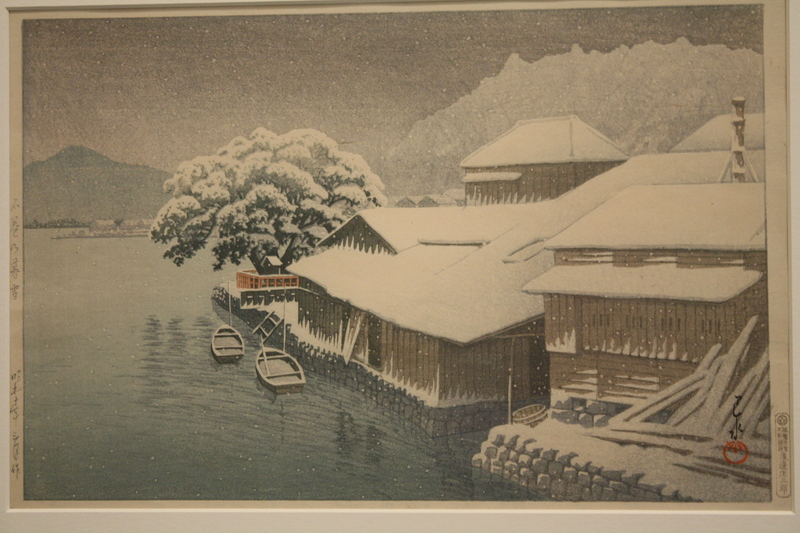 I picture so many tints of black and gray, making a very dark drawing, but this etching has large areas of white. And you can tell it’s night. It’s in the VMFA flower exhibit. Photography isn’t allowed in the show. I lifted this off ask.com. This show is a great inspiration! 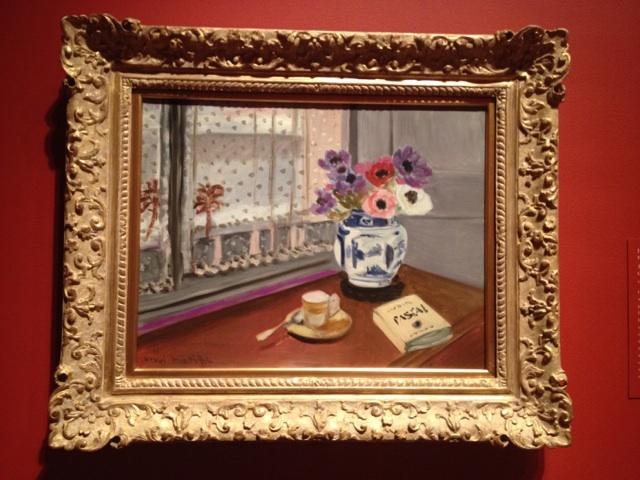 They have Van Gogh, Manet, Matisse and a lot of other artists. I got a sketch of a Manet painting, Vase of White Lilacs and Roses, which is one of my favorites. 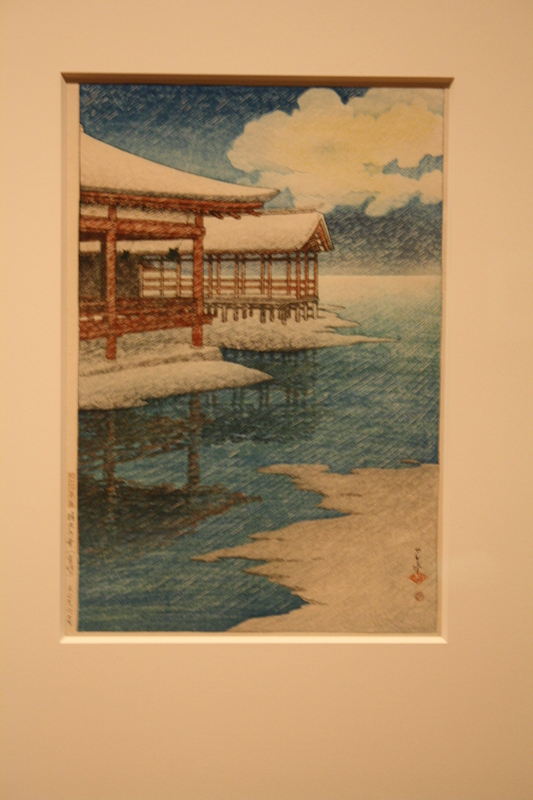 The museum limits you to graphite pencils only in the galleries with the paintings. They have a room with colored pencils and paper and a giant arrangement of flowers in the center for people to do their own drawing, but if you want to copy a masterpiece it’s graphite only! hahahahahha. Oh well, They’re scared, or so they say. As if a pencil might fly out of your hand and hit one of the paintings, only a graphite pencil won’t hurt it but a pastel pencil would? I don’t get it. You can get special permission to bring in pencils other than graphite but they make you jump through hoops for a permission paper, which is a little off putting for artists. I guess other artists don’t care because they don’t want to draw in the museum. 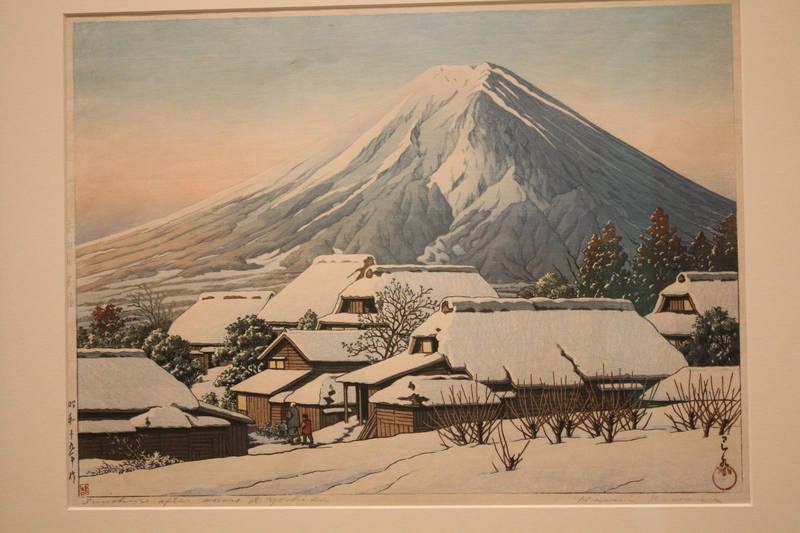 But maybe if the museum would relax a little, artists would feel more comfortable drawing there. Anyway, you should go see this show because you will want to paint flowers too! This might make the Winter Blues go away! 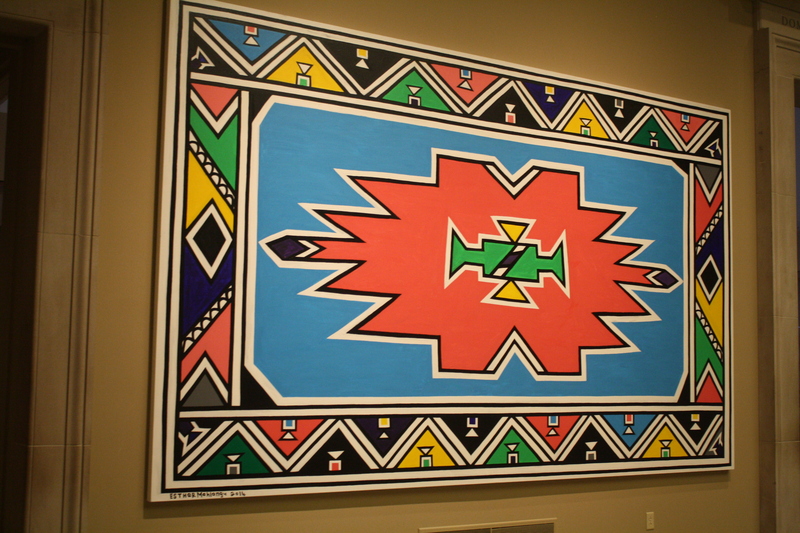 When I walked into the room and saw these big bright paintings, I said WOW! The plaque isn’t up yet so I don’t know the titles or any info, except a guard told me the artist is from South Africa. 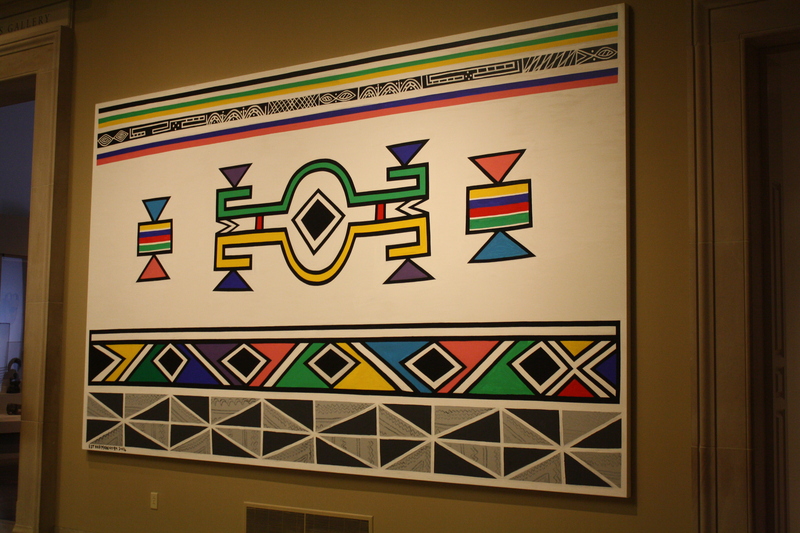 The designs reminded me of Native American art. This is a great exhibit at the VMFA. It’s so inspirational. 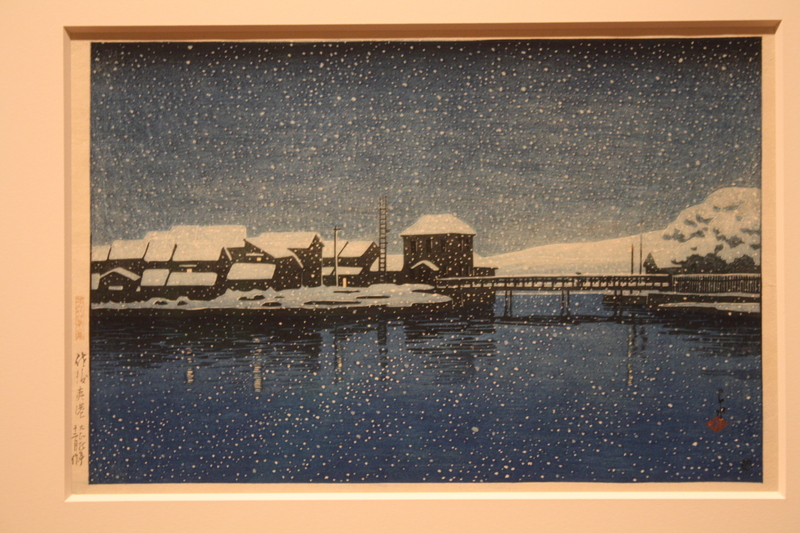 The plaques say it’s ink and color woodcut prints on paper. 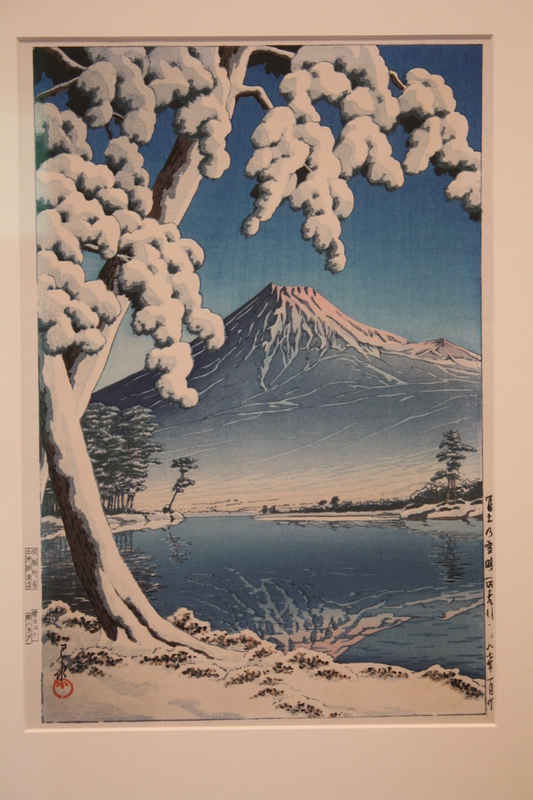 I wonder if it’s watercolor because they have some watercolor paintings by the artist. 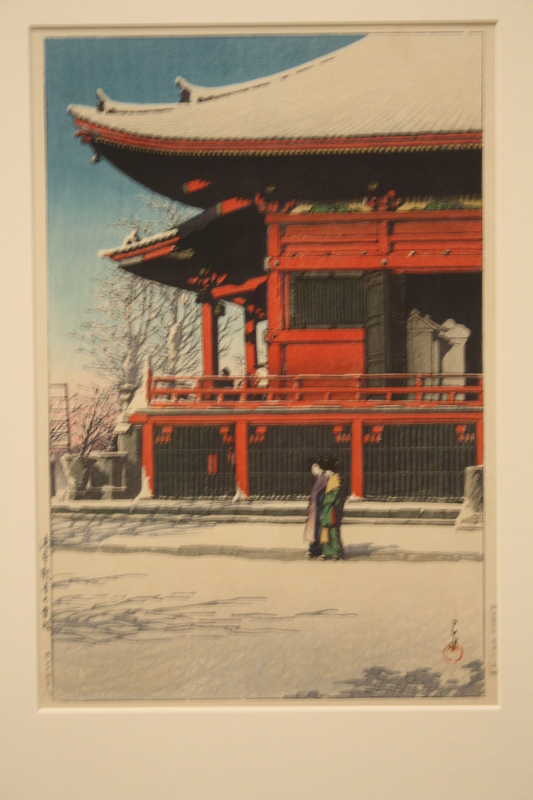 The colors look transparent on the woodcuts too. A lot of depth is showing. 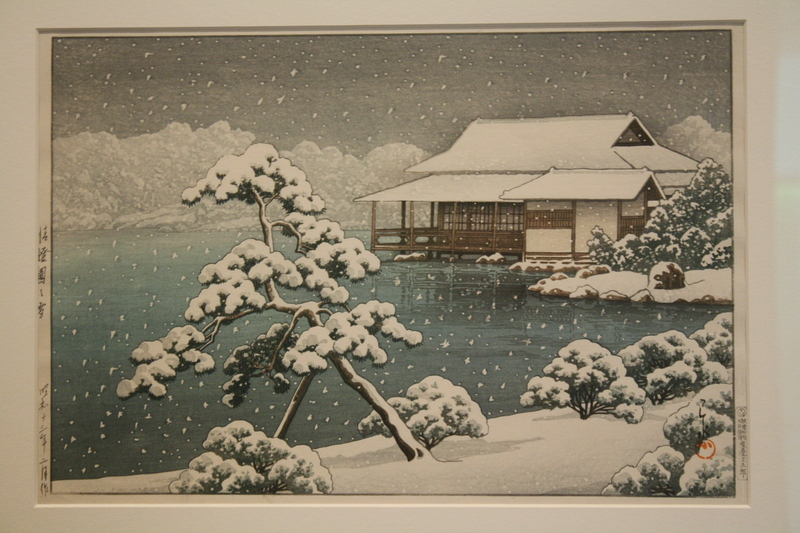 One of the plaques says it’s not traditional Japanese landscape. They also have a lot of info on the process he used. It’s complicated. But good to see how much work went into them. You can see layers of colors. I tried to see through the layers. 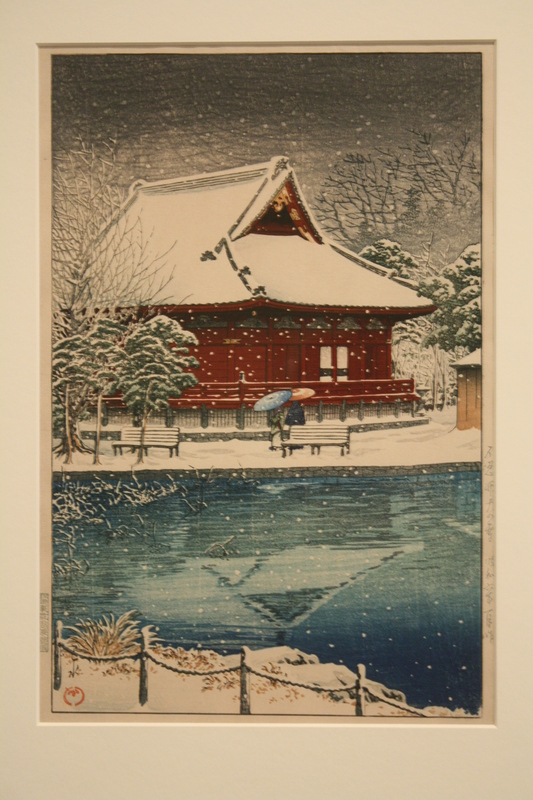 Kawase Hasui did watercolor studies and changed his composition and colors during the steps to the finished prints. He didn’t shy away from detail. The ones with snow have thousands of white dots for snow and the ones with rain have skinny gray lines to represent rain. 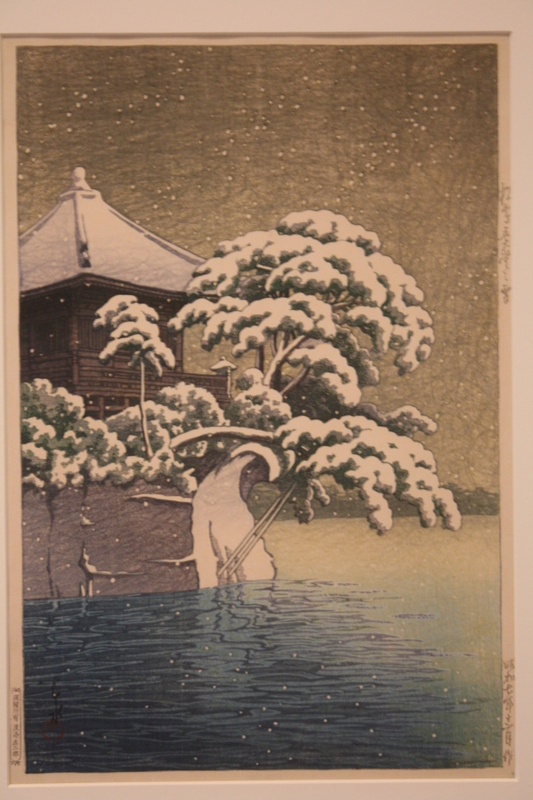 I wonder if they did a separate wood plate for the snow and printed it on top or if they gouged out tiny dots on the wood block so the ink wouldn’t go in those places on every block. 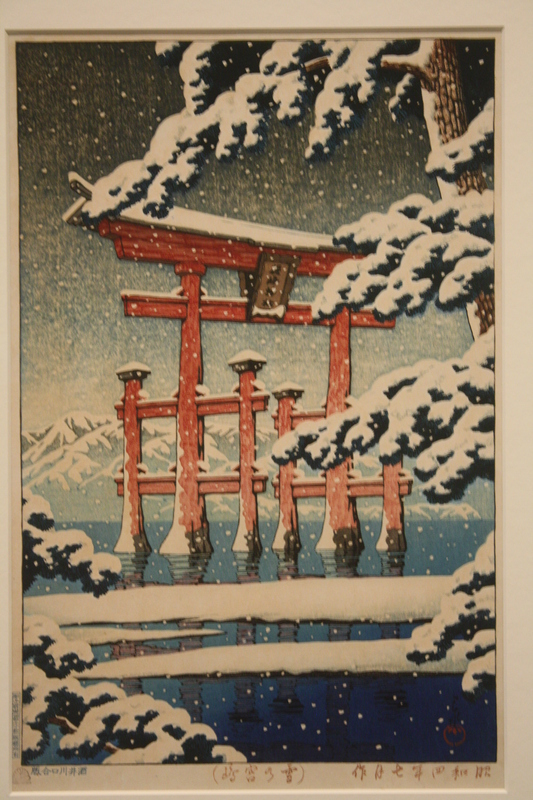 If you like looking at fine woodcuts you should see this exhibit.